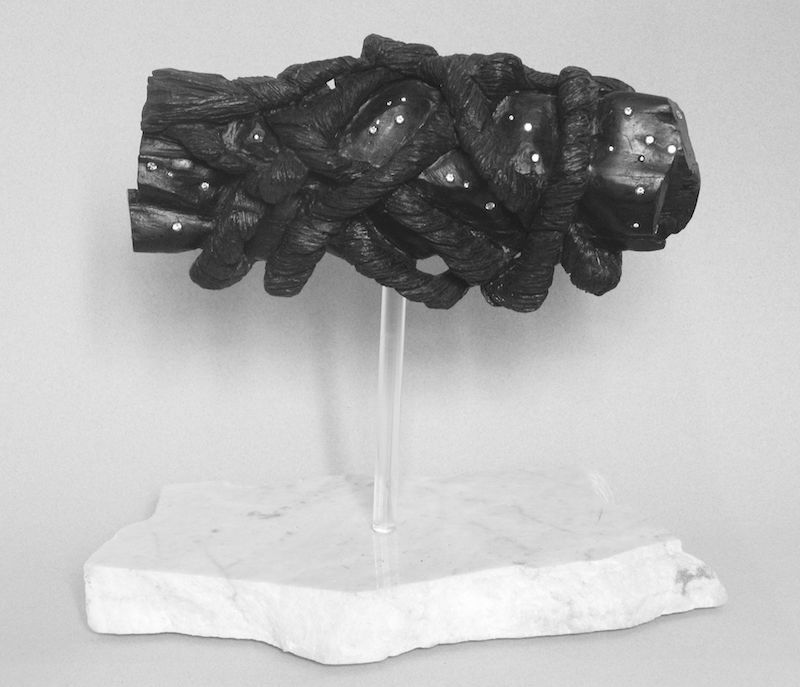 Image: Jacqueline Maggi, Starry Night, ebony wood, zirconia, acrylic rod, and marble, 12 x 12 x 8 in., 2016. MICRO-MONUMENTS II: UNDERGROUND brings together 23 artists from diverse backgrounds to focus a contemporary lens on ideas and concepts that humanity has grappled with for centuries. Reflecting on the ring sanctuary of Pömmelte, often referred to as the German ‘Stonehenge,” the exhibiting artists investigate deep time and explore the idea of what is hidden below ground, as well as what will be discovered, unearthed, and revealed. This exhibition aims to reveal a deeper understanding of people’s lives throughout history, and to allow contemporary artists to express their interpretations on topics of the cosmos, nature, current culture, and world heritage. Using the Nebra Sky Disc as a reference point—an artifact found near Pömmelte depicting a Bronze Age creator’s vision of the cosmos – the selected artworks are no larger than the Disc’s diameter of 12.6 inches. These archeological discoveries are evocative touchstones that invite contemplation of enduring questions about our history and place in the world. Can reflecting upon the past help broaden our understanding of ourselves and relationship to one another? Can rethinking how we study and understand the past give us insight into navigating the future? These are some of the questions examined by 15 Washington, DC artists along with 8 German artists, bringing global perspectives to shared human experiences. The theme for the exhibition came from the vision of our coordinating curator, Artemis Herber, with assistance from her German counterpart, Dr. Ines Janet Engelmann, who invited the 8 German artists to take part in this trans-Atlantic project. A call for entries was organized by the Washington Sculptors Group for the selection of the Washington-area artists, with independent curator and writer Laura Roulet serving as the juror. Laura Roulet is an independent curator and writer, specializing in contemporary and Latin American art. She was one of five international curators chosen for the citywide public art project, 5×5, a major initiative sponsored by the D.C. Commission on the Arts and Humanities in 2012. She has organized exhibitions in Mexico, Puerto Rico and the U.S., including at the OAS Art Museum of the Americas, the American University Museum, Katzen Center, the Mexican Cultural Institute, Artisphere, Hillyer Art Space, Project 4, Fusebox, and the DC Art Center. Recent exhibits and programming include A Dark and Scandalous Rockfall (Mexican Cultural Institute), Foon Sham: Escape (Katzen Center), Come Back to Rockville! a participatory, public art project for VisArts (Rockville, MD), Washington Produced Artists (40th anniversary for Washington Project for the Arts), the National Drawing Invitational (Arkansas Arts Center, Little Rock, AR), CSA: 40 Years of Community-Sourced Art (Arlington Arts Center, VA), and Medios y ambientes in Mexico City. She was a mentoring curator for DCAC and the first mentoring curator for VisArts in Rockville, MD in 2015. Roulet is a frequent contributor to Sculpture magazine. Her other publications include many catalogue essays, encyclopedia entries, articles in American Art, Art Journal, Art Nexus, and the book Contemporary Puerto Rican Installation Art, the Guagua Aerea, the Trojan Horse and the Termite. She worked on the Ana Mendieta retrospective, organized by the Hirshhorn Museum in 2004, and contributed to that catalogue. The Washington Sculptors Group (WSG) is a volunteer, non-profit organization dedicated to promoting awareness of sculpture and fostering exchanges among sculptors, sculpture enthusiasts, and the public. Organized in 1984, membership has grown to almost 400; WSG sponsors frequent public programs, and organize professional sculpture exhibitions juried by prominent curators. Visit www.washingtonsculptors.org to join WSG, to view the Web Gallery of members’ work, and to subscribe to the WSG newsletter. IA&A at Hillyer (formerly Hillyer Art Space) is the Washington-area initiative of International Arts & Artists, a non-profit organization dedicated to increasing cross-cultural understanding and exposure to the arts internationally through exhibitions, programs, and services to artists, arts institutions, and the public. Hillyer fulfills this mission through a series of exhibitions and public programs that feature local, regional, and international artists. Hillyer’s exhibition series focuses on under-represented artists, both emerging and established, that have not had a major solo exhibition within the last three years. MICRO-MONOUMENTS II: UNDERGROUND is presented by IA&A at Hillyer in collaboration with the Washington Sculptors Group and State Chancellery and Ministry of Culture of the State of Saxony-Anhalt. This project is supported by the D.C. Commission on the Arts and Humanities, an agency supported in part by the National Endowment for the Arts. EXHIBITION JUROR: Cecilia Wichmann, Assistant Curator of Contemporary Art at The Baltimore Museum of Art. Thursday, June 21 from 6-9 pm. Cecilia Wichmann is Assistant Curator of Contemporary Art at The Baltimore Museum of Art. Prior to joining the BMA in fall 2017, Wichmann led the University of Maryland’s Stamp Gallery, an experimental exhibition space for contemporary art, and served as curator and advisor of its innovative Contemporary Art Purchasing Program. Grounds are accessible any time. Opening Ceremony at 7:00 pm, “Medicine Wheel” performed by Eve Hennessa with water from West Africa and Mecca. 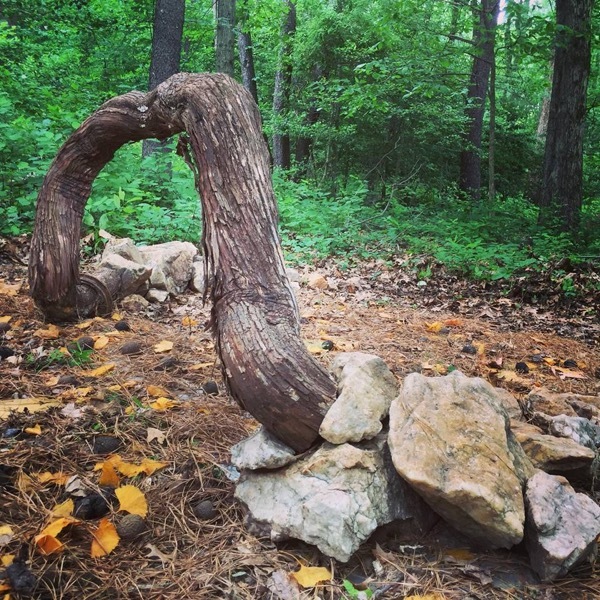 ART IN NATURE – (Re)Use and Abuse of the Land marks the second collaboration between the Washington Sculptors Group (WSG) and the Sandy Spring Museum (SSM). The aim of ARTINA 2017 is to create awareness among visitors and communities of the need to reconnect with nature now and preserve nature for future societies. Art functions as a mediator between nature and people to generate public attention and awareness by promoting a healthier and more environmentally meaningful and sustainable life. Life in and with nature can be experienced as living systems and can be experienced as nature’s regenerative power to recover from damage. The diverse, layered concept of ARTINA 2017 helps us to understand, appreciate, and value the ecosystems within nature and the natural systems and cycles involved. Art functions not only as an aesthetic stimulator to design a creative and sustainable environment, it also helps us to understand the connection between humans and nature as well as to lead us to find beauty in materials, forms, and their importance within living systems. In collaboration with the “International Visitors Program” supported by the NRW KULTURsekretariat curator program in Germany, WSG invited juror Ursula Achternkamp to make a connection between the continents and exchange contemporary perspectives on art in nature through Achternkamp’s selection of thirteen artists for ARTINA 2017. With emphasis on the use, reuse and abuse of the land, artists will focus on local or regional findings or research that address global issues. Artists will also emphasize concepts of mapping and meaning, and identification of places. Exploring geographies inspired and motivated by the actual condition of the land, its surroundings, its history and deep time discoveries, or by suburban developments and their impact on the environment are additional aims of the Artina 2017 exhibition. ABOUT THE JUROR: Ursula Achternkamp studied at the Academy of Fine Arts in Münster (D) and the École Supérieure des Beaux-Arts de Genève (CH). She freelanced at the Bauhaus Dessau Foundation and Exhibition-Projects such as curating the Permanent Exhibition of the Bauhaus-Settlement Dessau-Törten of Walter Gropius, Archilab Europe–Strategic Architecture (Cooperation of the Bauhaus Dessau with the FRAC Centre, Orléans, France, at the International Building Exhibition IBA Urban Redevelopment Saxony-Anhalt Less is Future. She has shown her artwork in several group and solo exhibitions in the Czech Republic, Belgium, France, Germany, Latvia and Switzerland. Participating in an international and interdisciplinary Bauhaus-Kolleg EU-Urbanism (2006-07) she investigated “After-Effects for a City” at the European Capital of Culture program, Luxembourg LU, and Sibiu RU. Achternkamp also collaborated with The Philosophical Farmers (Die Philosophischen Bauern), participated in the development and landing of UFO with Niklas Nitzschke in the frame of CULBURB (Cultural Acupuncture Treatment for Suburb) of the Centre for Central European Architecture in Prague. Open: Wednesdays–Saturdays from 10 am–5 pm. Open after hours for programming. APPLICATION DEADLINE: Entries must be posted on the EntryThingy website byApril 1, 2017 (midnight). German born curator and artist Ursula Achternkamp currently lives and works in an international artist-in-residence program in Stuttgart at the Akademy Schloß Solitude, a joint project between Robert Bosch GmbH, Akademie Schloss Solitude and Wimmelforschung. The purpose of the Fellowship is to support encounters as well as interdisciplinary exchange in the context of science, economy, and art. The collaboration’s aim is not the production of a specific artistic work, but the encounter and the process of intercommunication itself. Achternkamp studied at the Academy of Fine Arts in Münster (D) and the École Supérieure des Beaux-Arts de Genève (CH). Beside her own artistic works she freelanced at the Bauhaus Dessau Foundation and was part of several Exhibition-Projects such as: curating the Permanent Exhibition of the Bauhaus-Settlement Dessau-Törten in the Konsumbuilding of Walter Gropius; being part of the curatorial team of Archilab Europe–Strategic Architecture (Cooperation of the Bauhaus Dessau with the FRAC Centre, Orléans, France 2008); as well as contributing to Projectwork at the International Building Exhibition IBA Urban Redevelopment Saxony-Anhalt Less is Future. She has shown her own artistic works in several group and solo exhibitions such as in the Czech Republic, Belgium, France, Germany, Latvia, and Switzerland. Participating in an international and interdisciplinary Bauhaus-Kolleg EU-Urbanism (2006-07) she investigated “After-Effects for a City” by taking part at the European Capital of Culture program (research in Luxembourg (LU) and Sibiu (RU) 2007). She was artist in Residence at the Nomadic Village organized by Klaus Mähring with ISIS Arts/ County Durham (GB) and AIR in Havelberg (D) and in Roja (LV). She was awarded residencies in 2011/12 at the Akademie Schloß Solitude in Stuttgart (D) Fellow Section Architecture, guest of the International Summer Program of the Raketenstation Hombroich (D) in 2012 and 2013, where she was invited as curator for the program in 2015. She gained the Prix 2006 de la Fondation Gertrude Hirzel, Prix Neumann de la Ville de Genève in 2004, and in 2001 the Förderpreis of the Art Academy Münster. ART IN NATURE marks the second call for a cooperation between the Washington Sculptors Group and the Sandy Spring Museum within a cross-Atlantic partnership of internationally acclaimed curators. Sandy Spring Museum is a special place, away from the bustle of daily routine and fashionable trends from the city. It is an invitation to enter into the adventure of a direct encounter with art and nature and its rural historically grown landscape. Visitors are free to walk their own way around the museum and its park and adjacent woods and make their own discoveries of art and nature alike. This freedom of the spirit is at the heart of the Museum’s particular charm. A day at the Sandy Spring Museum awakens the senses. The aim is to create awareness among visitors and communities to reconnect with nature today as well as in the future. Art functions as a mediator between nature and the people to generate public attention and awareness by promoting a healthier and environmentally more meaningful and sustainable life. Life in and with nature can be experienced as living systems and can be experienced as nature’s regenerative power and the capability to recover from damage. 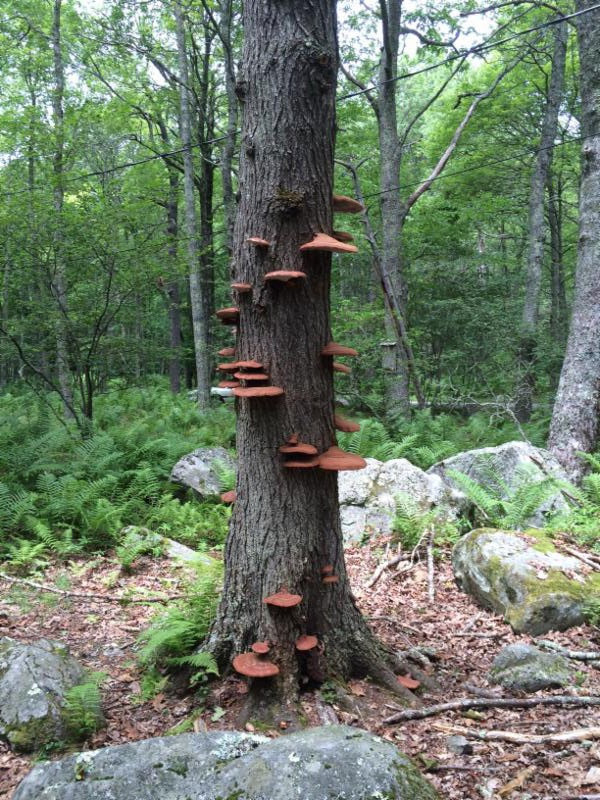 A diverse layered concept of ART IN NATURE helps to understand, appreciate, and value the ecosystem offered by nature and its natural systems and cycles. Art functions not only as an esthetic stimulator to design a creative and sustainable environment, but helps to understand the connection between man and nature. One can find its beauty in materials, forms and living systems, and fields of science that artists can convey, in which the arts create the trans-disciplinary realm outside a world of utilitarianism. WSG and SSM seek a collaboration to enhance communities’ social engagement with nature, and the environment through concepts of participation and collaboration and contemporary concepts. A diverse and multilayered program creates a broader platform for today’s highly diverse audience that needs to be approached through diverse artistic relationships to nature that can be natural, environmentally friendly, architectural, conceptual, narrative, representational, time-based, and interdisciplinary to regenerate our deep connection with nature. In collaboration with the Sandy Spring Museum, the Washington Sculptors Group seeks to realize a Land Use Project that addresses issues of how we use our land today and in the future. Artists are invited to look into matters of deep time, the history or the current condition of local and regional observations (or through research) that will raise public awareness of environmental issues for the future. In continuation of ARTINA 2016, WSG and the Sandy Spring Museum will proceed with their shared philosophy of connections between nature and humankind, including nature as a living system for a more environmentally meaningful and sustainable life, as well as key issues involving our ecosystem and its regeneration and recovery through the arts as a mediator. With emphasis on the use, reuse and abuse of the land, artists will be encouraged to focus on local or regional findings or research that generate discoveries on a global level. Artists will emphasize their main focus with concepts of mapping and meaning, identification of places, or exploring geographies. Artists will also be inspired and motivated by the actual condition of the land, its surroundings, its history and deep time discoveries, or by suburban developments and their impact on the environment. Artists will raise questions about their findings (such as with sticks, trees, mud, bricks, rocks etc.) and insights that create a preview of the work on site at the Sandy Spring Museum. WSG and the Sandy Spring Museum will seek outdoor artwork that engages concepts of the land we use, occupy, exploit, reuse or abuse within the given context of “Art in Nature” as a metaphor for an environmentally meaningful and sustainable life. 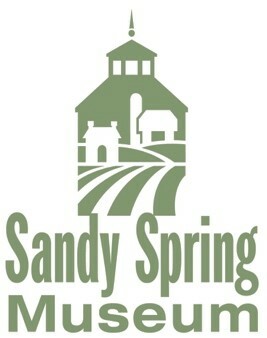 The Sandy Spring Museum will help to provide maps and to connect with schools or youth groups such as the Girl Scouts and Boy Scouts, or with the general public in order to link the artists’ concepts with their work and with visitors. The exhibition will engage artists on site that involves collecting materials on site or from home and connect with the artwork; include developing and gaining space-digital presentation or projection; incorporate a participatory artist project at the opening reception; and introduce a performance artist or dancer who interacts with the various art sites during the opening reception. The Sandy Spring Museum and WSG intend to provide a program that relates to the exhibition between June and mid October 2017. We encourage artists to seek a relationship with its audience through socially engaged art through collaboration, participation, dialogue, provocation, and immersive experiences. The SSM and WSG focus on process and seek to embed themselves within the communities. The Sandy Spring Museum is a place where people make meaningful connections to community history through the cultural arts. The museum is a gathering place with interactive projects, artist studios, changing exhibits, evening programming, live music, and opportunities for the public to use the museum facility in order to build community. The Sandy Spring Museum is located on 7+ acres of land, 3 acres of which are heavily forested. The remainder is naturally landscaped with mature trees. Sculptures can be exhibited throughout the property, including upon two 12’x 12’ concrete pads. Artists can also use a wooden trellis that blooms with wisteria in the spring and extends the entire length of the property. The exhibition is open to current members of the Washington Sculptors Group only. Artists may join WSG by paying annual dues of $45 ($15 for full-time students). Prospective members may download a membership form from the WSG website, www.washingtonsculptors.org and send in a check, or may join online with your submission to the exhibition. WSG members must have paid their dues for 2017 by the entry deadline to be eligible for this exhibition. The address label is on this Call or the most recent copy of the WSG newsletter, The Washington Sculptor, will show your membership status (example: MEMBER THROUGH 2017). Notices for 2017 dues were mailed Dec. 2016. The Sandy Spring Museum will award an honorarium specifically for those artists who develop concepts that are either socially engaged or include participatory, collaborative, or time-based projects with local communities or neighborhoods. The award of the honorarium is at the discretion of Sandy Spring Museum. – Artist or artist teams are welcome to submit pre-existing artwork or a proposed artwork that reflects on the theme ART IN NATURE. Artists who apply will install their work in accordance with either the provided artist proposal or in collaboration with the exhibition team and Sandy Spring Museum. – A maximum of 5 images per artist or team will be considered. If an artist is proposing a work that involves community participation, SSM may be able to recruit volunteers to assist with the creation or installation of an artist’s work. Requested assistance will need to be coordinated between SSM and the artist. To make arrangements with SSM and get support from volunteers, selected artists will be required to discuss specifics about the site, setting, and layout of the installation with SSM staff and exhibition coordinators. Artists may choose to install their work with public participation and involvement during the installation period, or if required, over the life of the artwork. Artists will submit a proposal in .doc or .pdf format containing the project description, concept sketches or renderings, and any other information pertaining to the proposed project. In addition, artists will provide up to 5 images of existing work in .jpg format titled portfolio001”–‘portfolio005”.jpg.” Submit all images with a resolution of 300 dpi and a maximum of 2MB each. It is recommended that artists visit the Sandy Spring Museum to get a sense of the surroundings and possibilities prior to submitting an application. Artists can visit the site seven days a week, at any time. If you wish to meet with museum staff, please contact Allison Weiss ahead of time at (301) 774-0022 or gro.m1555988404uesum1555988404gnirp1555988404sydna1555988404s@ssi1555988404ewa1555988404. The official opening reception will be held Thursday, June 29th from 6:30–9:30 pm. Selected artists are invited to the reception opening to the public to engage visitors with hands-on activities. SSM reserves the right to make photo documentation for promotional and archival purposes, both print and electronic. The EntryThingy website allows entering information about your entries and viewing by the juror. 1) Applicants should go to http://www.entrythingy.com/ and click on the tab (at top) “for artists”. 2) Click on “list of current calls”. 3) Scroll down and click on the ART IN NATURE listing. 4) Create a login account to http://www.entrythingy.com/ if you don’t have an account, or if you do, login to your existing account with the “Click here to login” button. After logging in, select theSculpture REMIX 2017: Craft/Technology/Artcall and complete the entry steps. 5) There is a $5 entry fee. 6) All applicants will receive ‘accepted’ or ‘not accepted’ notifications via email. Assistance with submissions is available by email request: contact gro.s1555988404rotpl1555988404ucsno1555988404tgnih1555988404saw@s1555988404eirtn1555988404e1555988404. When uploading your images, you will be provided space for six uploads. That number is for 5 images and an artist statement. Do not send any more than five images as if there is a sixth image it will be discarded. SSM will insure the work after the work is delivered and the exhibition loan agreement is signed. Insurance during transportation is the responsibility of the artist. There will be no commission taken by the venue of any work sold during the exhibition. Purchase inquiries will be directed to the artist. Jon Lundak; Grant McFarland; Adam Bradley; Meirav Finn; Tory Cowles; Martin Feldman; Helen Glazer; Marc Robarge; Iris Posner; Jenny Wu; c.l. bigelo (yes, all lowercase) ;Judith Goodman; Siavash Tohidi; Judith Pratt; Linda Agar- Hendrix; David Alfuth; Julie Zirlin; Eve Hennessa; Adam Hager; Lynda Andrews-Barry. JUROR: Allison Nance joined international Arts & Artists in 2013 as Director of Hillyer Art Space. Prior to this she was with the Torpedo Factory Art Center from 2008-2013. She co-founded Microwave Project LLC in 2010, a curatorial partnership that acts as a conduit between artists and businesses, exploring alternative exhibition venues with an emphasis on site-specific installation art. Allison is Vice-Chair of the Alexandria Commission for the Arts, whose role it is to advise City Council with regard to policies that would strengthen the arts and further public access to the arts and cultural matters. She is the Chair of the Commissions Grant Committee, and for the last three years has worked on the Commission’s Annual Work Plan Task Force, outlining which new public art projects the city of Alexandria will initiate, indicating where the projects are located, and what the proposal budgets will be. Allison joined the ArtTable in January 2016, and is currently the co-chair for the membership of the Washington DC chapter. Washington Sculptors Group is pleased to present Sculpture Now 2017 in collaboration with McLean Project for the Arts. 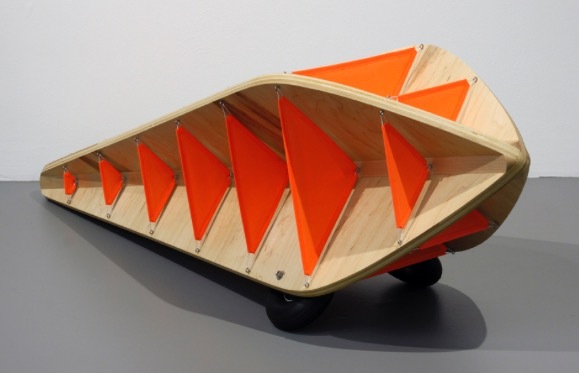 Sculpture Now is a non-thematic exhibition of new works, finished within the last two years. The Rooney Prize – an honorarium of $500 – will be given to an artist/artist team whose work reflects the best qualities for the overall WSG Sculpture Now 2017 show. About the Juror: Nancy Sausser, Exhibitions Director of the McLean Project for the Arts (MPA). Nancy Sausser has been the Curator and Exhibitions Director at MPA since October 2005. A sculptor and arts writer as well as a curator, her writing has been featured in publications such as the Washington Post and FiberArts Magazine, as well as in many exhibition catalogs. Her sculpture has been shown around the Washington, DC area, most recently at Greater Reston Arts Center, Montpelier Arts Center, and Glenview Mansion. Nancy holds a BA in Studio Art from Kenyon College and an MFA in Sculpture form the University of Washington in Seattle. What is a landmark? It may be something built by human hands, or be something that exists in nature. It often connotes the idea of place, of a direction or a turning point. It could be a totem, a flag, or a magic symbol marking a liminal threshold. It could be a mark on the ground or on a wall, or it could be a tall structure. It could be a memorial or a monument. Landmarks can also be understood in terms of time; a moment between one period and another, or historically between one people and another. It can be seen as a sign of the times, a moment of crisis or change such as a “landmark decision” or “landmark legislation”. Landmarks are everywhere in our world and in our language. Claudia Rousseau completed her PhD at Columbia University in New York, and has taught at Montgomery College since 2003. An internationally published scholar, she is also a recognized critic of contemporary art and a curator of art exhibitions in the region. In 2010, she earned membership in the prestigious International Association of Art Critics (AICA) for her writing on art including 11 years of monthly reviews as art critic for the Gazette newspapers, Dr. Rousseau currently serves as a panel member of the Public Arts Trust Steering Committee of the Arts and Humanities Council of Montgomery County, as well as the Art Review Panel for the Maryland-National Capitol Parks and Planning Commission for public art. ART IN NATURE marks the first collaboration between the Washington Sculptors Group (WSG) and the Sandy Spring Museum (SSM). The aim of ART IN NATURE is to create awareness among visitors and communities to reconnect with nature now as well as in future societies. Art functions as a mediator between nature and people to generate public attention and awareness by promoting a healthier and more environmentally meaningful and sustainable life. Life in and with nature can be experienced as living systems, and as nature’s regenerative power to recover from damage. A diverse, layered concept of ART IN NATURE helps us to understand, appreciate, and value the ecosystem offered by nature and its natural systems and cycles. Art functions not only as an aesthetic stimulator to design a creative and sustainable environment, but also helps us to understand the connection between humans and nature. One can find beauty in materials, forms, and living systems. Renowned art historian Martine Van Kampen of the Netherlands served as juror for ARTINA 2016. She is Curator of the Land Art Live, a series of programs and performances taking place at the six major Land Art works in the province of Flevoland. Van Kampen also serves as a curator for TAAK, a cooperative of cultural workers who create projects, art, and educational programs related to public, social, and environmental issues. TAAK also serves as an international platform that develops innovative art projects and educational programs relating to social issues such as ecology, urbanization, social design, and human rights. In 2015 Van Kampen was invited by the International Cultural Relations of NRW KULTURsekretariat, Germany to attend the International Visitors Program Research Trip: Dialogue between Art and Nature – Methods and Strategies of Curating Art in Public Space, creating a bridge between the continents, and exchanging contemporary perspectives on art in nature in the network between WSG and SSM. Van Kampen lives and works in Amsterdam. WSG and SSM seeks a partnership to enhance communities’ social engagement with nature and the environment through concepts of participation, collaboration, and contemporary concepts. A diverse and multilayered program creates a broad platform for today’s highly diverse audience that needs to be approached through a range of artistic relationships to nature, which can be natural, environmentally friendly, architectural, conceptual, narrative, representational, time-based, and interdisciplinary, regenerating our deep connection with nature. An invitation to help build works for ARTINA! Help Create a River of Sticks: June 11, 12-4 pm with exhibiting artist Diane Szczepaniak. All ages are welcome; no artistic ability or experience is needed. Click here for details and to register to participate. Help Build Day/Night, a Series of Woven Tree Structures: June 25, 12-4 pm with exhibiting artist Fabiola Alvarez Yurcism. All ages are welcome; no artistic ability or experience is needed. Wednesdays–Saturdays from 10 am–5 pm. Open after hours for programming. ABOUT THE EXHIBITION The concept of “Micro-Monuments” conveys a global perspective through miniaturization as a symptom of our times that derived from diverse cultural backgrounds of the exhibiting artists. The exhibition explores the omnipresence of monuments as a universal idea in art within a trans-disciplinary and trans-cultural context of today. 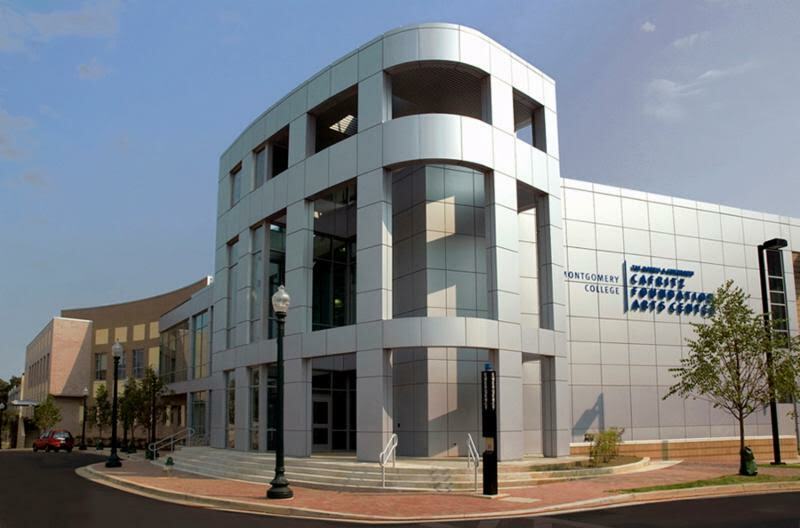 As an exhibition returning from Germany to the United States and its place of origin, the city of Washington, D.C., the Center for Hellenic Studies (CHS) creates an even more interconnected field between cultures, societies, and time through a cross-cultural collaboration. Arranged in a multi-contextual exhibition design, each Micro-Monument represents diverse perspectives with arbitrary viewpoints from afar, and at the same time suggest a relationship within the specific installation milieu. The exhibition conveys the impression of Cabinets of Curiosities, representing a collection of worldviews of cultural heritages contributing to the depiction of a global perspective within an array of wonders. Micro-Monuments features works by selected artists of the Washington Sculptors Group, as well as a stunning selection of artifacts as a crossover exhibition with references across time, place, and cultures in the interior of the Center For Hellenic Studies in Washington, D.C. As a traveling and returning exhibition from Germany, it creates a different statement showing the same artworks within the context of the Center of Hellenic Studies than originally presented in the Salzland Museum in Saxony-Anhalt, Germany. Originally motivated by local excavations of a four circular grave system, the ancient monumental sanctuary is seen in the new context of the Center of Hellenic Studies in Washington DC, a city of monuments and monumental architecture. 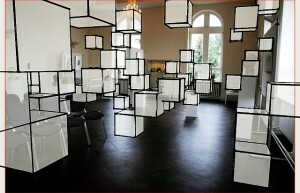 The artworks and the concept of the exhibition itself undergo a transformation. However the contextual analysis and exploration of deep time art projects still reveal a deeper understanding of people’s lives in prehistoric times, and will allow artist’s interpretations on topics of the cosmos, nature, and contemporary culture, as well as past and future societies. Juried by Anne Reeve, 32 selected small-scale sculptures created within a “micro” format convey a global perspective that is informed by either the artist’s own personal background, or by experiences with other cultures and peoples, internationally or locally. Their global perspectives create references for Micro-Monuments. About the Juror: Anne Reeve serves as assistant curator at the Glenstone Museum in Potomac, MD. Her writing has appeared in Art in America and Art Papers, and she is currently at work on a publication to accompany Glenstone’s upcoming exhibition of works by late American artist Fred Sandback. About the Curator: Artemis Herber was appointed as the curator for Transatlantic Cultural Projects Saxony-Anhalt to realize cross-cultural projects. She currently serves as the President of the Washington Sculptors Group. Micro-Monuments is organized by Washington Sculptors Group, a non-profit organization founded in 1984 dedicated to promoting awareness of sculpture and fostering exchanges among sculptors, sculpture enthusiasts and the public. Local excavations of four circular grave systems between the villages of Schönebeck and Pömmelte-Zackmünde have revealed an ancient monument site called the “German Woodhenge.” Inspired by the mysterious site at Schönebeck, Germany, 23 artists created small sculptures to generate a dialogue regarding the surrounding excavation sites and the extraordinary scientific findings in the overall context of prehistoric monuments across cultures. Selected by Juror Anne Reeve, these 23 artists represent multiple countries, including artists from the United States, Ireland, Mexico, and Germany. Anne Reeve is Assistant Curator at the Glenstone Museum, Potomac MD. 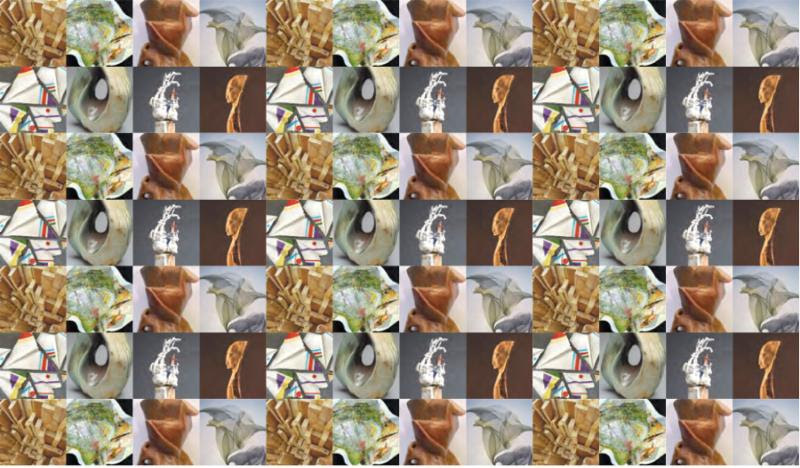 The contextual analysis and exploration of this site through art projects is intended to reveal a deeper understanding of people’s lives in prehistoric times, and allow artists’ interpretation on topics of the cosmos, nature and contemporary culture, as well as past and future societies. 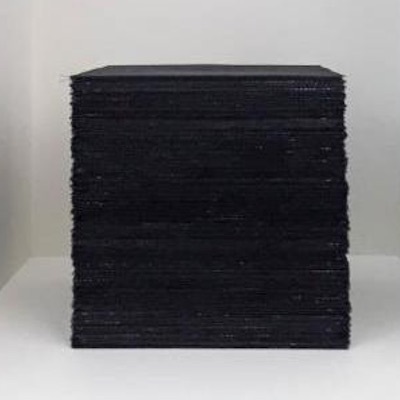 Thirty-two small-scale sculptures created within a “micro” format convey a global perspective that is informed by either the artist’s own personal background, or by experiences with other cultures and peoples internationally or locally. Their global perspectives and diverse artistic approaches interact with concepts of monumentality with regards to space, time, place, and cultural understanding. Artists: Julia Bloom, Greg Braun, Elsab Dixon, Stephanie Firestone, Felicia Glidden, Carol B. Goldberg, Tom Greaves, Edel Gregan, Jonathan Guyer, Kelly Lorraine Hendrickson, Jin Lee, Leigh Maddox, Jacqueline Maggi, James Mallos, Kass McGowan, Elizabeth Miller, Jim Paulsen, Tatyana Schremko, Mike Shaffer, Lynda Smith-Bugge, Garret Strang, Lawrence S. Watson, Fabiola Alvarez Yurcisin.